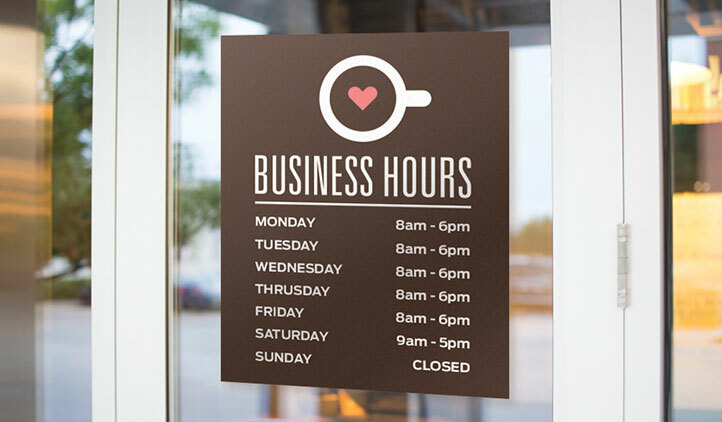 Make custom business hours stickers for the front window or door of your business. Customized hours of operation decals look professional, providing branding and signage. Our removable vinyl decals will not damage surfaces. Looking for individually cut letters and numbers? Try our Vinyl Window Lettering. Personalized window decals are an excellent and easy way to advertise your location hours to customers. These vinyl decals can be created to match your business style and colours. Be sure to add your business logo to the store decal so your branding is consistent and in front of your audience. These decals look much more professional than standard “hours of operation” door signs, are more cost effective, and are easy to apply or remove. You may also want to add such information as your web address, email or phone number so customers can contact you or find more information. Or add your social media contact such as your Twitter handle so customers can follow your business socially. Add an Instagram hashtag so pictures taken at your business location can be shared. 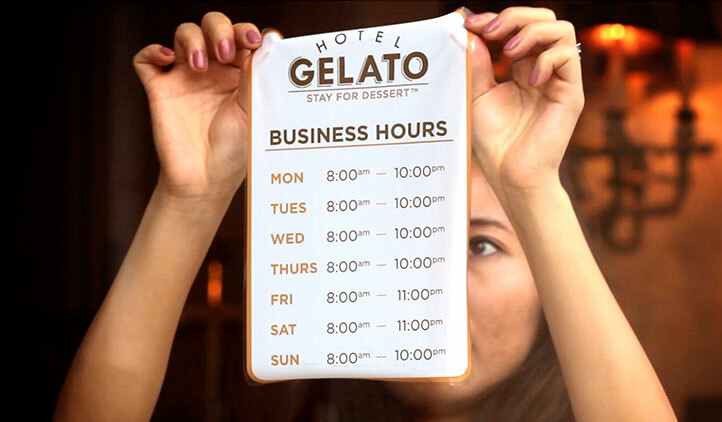 Inclusion of this information in an easy to find spot, such as your business hours window decal, will help grow your audience. If you only need a short term solution, these open hours window decals are an affordable and beautiful option. Advertise special holiday hours or other changes in your store front window with these sticky signs. The store hours decals will stick great to the glass window of a storefront or a door. The white vinyl material has great colour reproduction and can be applied bubble-free to the outside of the glass or door. The durable vinyl has a strong adhesive which will make sure it stays in place. However the hours of operations stickers can be removed at any time without causing any damage to the glass or window. This material is waterproof, heat resistant and UV fade resistant which means this weatherproof decal will look great in any conditions. The clear vinyl window decals have both a front adhesive and back adhesive option so they can be applied to either the outside or inside of a window. The clear sticker will blend in well with the glass, helping your business hours and information to stand out on the glass.